Bushnell has been the industry leader in high-performance optic cameras for more than 50 years. Either from hunting, fishing, birding and even for nature study.Bushnell has bring out true to it’s product to provide the highest quality ever since. This 2013 model game trail camera continues to be a well sought after product with its super-tuned advancements. The Trophy Cam trail cameras 1-year battery life and 0.6-second trigger speed lead the way. Now you can get an even bigger picture of wildlife movement with the Field Scan time-lapse technology and you could also set it at pre-set intervals ranging from 1 to 60 minutes. Bushnell has also added audio record to their video mode. You can now record more images and video than ever before on your trail camera with the 32GB SD card compatibility. These features make these one of the best rated game trail cameras on the market even still today. 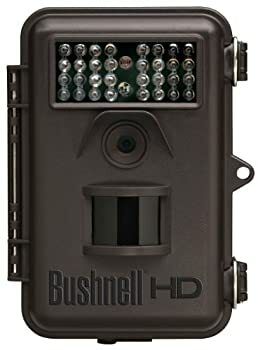 There are several wonderful features that you will enjoy by purchasing the Bushnell 8MP Trophy Cam HD Hybrid Trail Camera with Night Vision, Brown. The 8MP full high quality color resolution camera will provide you with 1 to 3 images per trigger and 1280x720 HD video along with crystal clear audio that can be recorded from 1 second to 60 seconds in length. 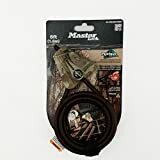 Customers are loving this amazing trail cam as some don’t even use them for hunting purposes, but rather the monitoring of the wildlife in the area. One customer said that the photos and videos are beautifully clear, although the quality changes based on the time of day and conditions of the area the camera is in. ​Another customer mentioned that the setup of the camera was so easy a toddler could probably do it without batting an eye. And another enjoyed the quality of both the video and the sound that he was able to get from a camera within the price range. There are many reasons why this camera is an excellent camera for its price. First it provides you with photos and video with audio. Second it possesses weather proofing to provide versatility in placement of the camera to capture images of the wildlife. ​And finally it allows you to research the conditions that the wildlife is traveling in such as moon phases and time of the day or night. This information can not only give you a better idea as to when you should go hunting, but also tell you when the deer are closest to the camera and how long they spend in the area. You will also appreciate the price that this camera is going for as it is a steal in comparison to other brands and products. How long does this camera last if you are taking a photo say every 10mins for about 8 hours a day (for a construction time-lapse)? I know this might not be the absolute answer you are looking for but I would say months. This is assuming you are using 8 Lithium batteries not taking night photos and no videos. I use mine for taking 15 second videos with about half of them taken at night totaling between 10 and 15 per day and I cannot remember when I last changed the batteries. Also you may not know but there is a graphic symbol on the screen inside indicating battery condition and a blue light will come on in the front at some point. To do what you are talking about I think will require you to turn the unit on and off to start and stop recording as you want. Is the night LED flash visible to the animal? Will it scar them away? Or is there a passive infra red system that allow for covert night surveillance? Does this have a 2 inch view finder, or any view window for that matter? Does it come with a strap or something that will hold it in a tree? Can you use a security cable only, or do you have to get a security box to secure it to a tree? The mounting strap that comes with the camera is of sufficient length to go around a tree, post, or any other fixed object. Make sure the camera is not obstructed by small limbs or leaves, otherwise it would be activated every time the wind blows. Is the Bushnell 8MP Trophy Cam HD Hybrid Trail Camera with Night Vision, Brown water proof? I am not 100 percent sure. I have a few friends that have the 6mp and it seems to be the same set up but you can definitely tell the quality of the pictures from the 6 to the 8. I would read up on the specs on bushnells page. I know my 8 has filed mode video mode just to name a few Im not sure if the 6 offers them. But defiantly check out bushnells page and even YouTube. I love the 8 I will be buying 2 more before this coming deer season great cameras best you can buy. Hope I helped out! How the batteries work even in sub temperatures in this camera or does the cold will kill the batteries in any camera no matter? The weather doesn't get excessively cold. However I have gotten more than 1 year out of a set of batteries. Can you setup the camera so the captures will loop? , "newest photos replacing the oldest"
Nope. They are recorded on the memory card in the order in which they are taken. Hello, I live in Costa Rica, I want to put the camera in a rainforest. Would this camera be ok with the amount of rain in a rainforest in the tropic? Yes, but I also add a rubber roof on mine, use epoxy glue, let edge run over a little. I only want to use it for time lapse photography. how far apart can i set the time lapse? can i set it to take one photo a day for a year? Would this camera capture neighborhood vandals night shots? Yes it would. But it would need to be aimed correctly and somehow "hidden" from view. Is this MAC compatible? A reviewer said not & want to purchase for Xmas gift for Mac users. Yes, the movies are .avi and play just fine on Macs. Is this the 2013 or 2012 model? The 119537 is a 2013 model - which is what this is supposed to be. The 119437 is the 2012 model. How do I delete pictures from my sd card? I always remove the card, transfer the files to my laptop and use the laptop file manager to delete them. Can you use a 12 volt battery with this camera in place of the AA batteries? I am not sure about the 12V battery, but I think a solar panel charger is made for it. Regular battery life is good so you may want to start there to see how long you get. Mine have lasted 3 months, taking an average of 50 pics a day... and they are at 50%. Does this take color night vision video/photos? No. Night vision is all black and white (more grey). Fairly good pictures, though. There is a neighborhood thief stealing valuables from peoples cars at night. Will this camera capture quality night video from 35 ft? Please provide the true video playback resolution(s) and each associated frame rate. Product Details Product Dimensions: 12 x 12 x 12 inches This seems extremely large is this the accurate dimensions? What is the distance this camera will take clear photos? I'm going to use it to photograph my neighbor dumping trash over a fence about 100' long. I am amazed how clear and sharp the photos are at a distance of 100' plus during day light hours. At night it's a different story. The subject has to be fairly near to get a good picture. I would guess between 25 to 50 feet. Can you program this camera to only work during certain hours, such as from 8 PM until 5 AM? Yes, you can program the camera for certain hours. There is a program called "field scan" that allows you to select up to two time periods for the camera to operate. I'd like to transfer the video to a dvd or computer. How do you do this with a simcard? Is there a USB port on it or can't it be done. You can connect the camera directly to your computer and download pictures/videos with the included cord. I view any pictures from the camera on my computer and have found it quite easy.